Things are looking better in St. Louis. For decades, St. Louis has been one of the slowest-growing metropolitan areas of the United States. Its historical core city has lost more than 60 percent of its population since 1950, a greater loss than any other major core municipality in the modern era. Nonetheless, the metropolitan area, including the city, added nearly 50 percent to its population from 1950. The fate of St. Louis has been similar to that of Rust Belt metropolitan areas in the Midwest and East, as the nation has moved steadily West and South since World War II (Note). Expensive Housing and Driving People Away: During the past decade, high house prices have driven residents away from areas with better amenities, especially California’s coastal metropolitan areas and metropolitan New York. Between 2000 and 2009, Los Angeles exported 1.4 million domestic migrants, the San Francisco Bay Area 600,000 (San Francisco and San Jose) and San Diego 125,000. New York lost nearly 2,000,000. St. Louis did much better, losing less than 45,000 domestic migrants. On a per capita basis, St. Louis also performed better, losing 1.6 domestic residents per capita to migration, compared to 4.5 in San Diego, 10 in the San Francisco Bay Area and 11 in New York. This may not sound like an accomplishment, but the St. Louis area has probably not outperformed California in terms of migration since it entered the Union in 1850. The big change between the 2000s and previous decades lies in housing price. 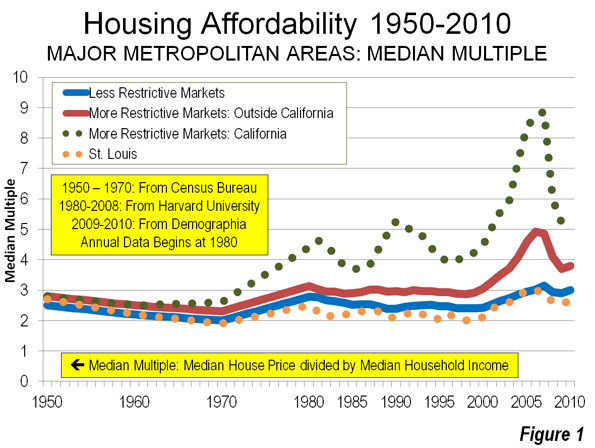 It is in this period that America became effectively two nations in housing affordability. The major metropolitan areas that experienced that largest housing bubble lost 3.2 million domestic migrants, while those with lesser or no bubble gained 1.5 million. Demonstrating the preference of people for more dispersed surroundings, even more (1.7 million) moved to smaller metropolitan areas. Housing affordability has emerged as a principal competitive factor among metropolitan areas. 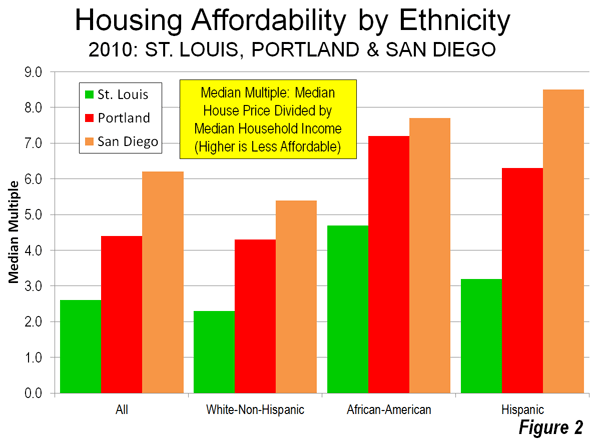 Superior Housing Affordability: This is where St. Louis excels. As of the third quarter of 2011, the median house price was 2.6 times the median household income in St. Louis, according to the 8th Annual Demographia International Housing Affordability Survey, which covered seven nations (the United States, United Kingdom, Canada, Australia, Ireland, New Zealand and Hong Kong, in China). Dividing the median house price by the median household income gives St. Louis an affordability rating (Median Multiple) of 2.6. 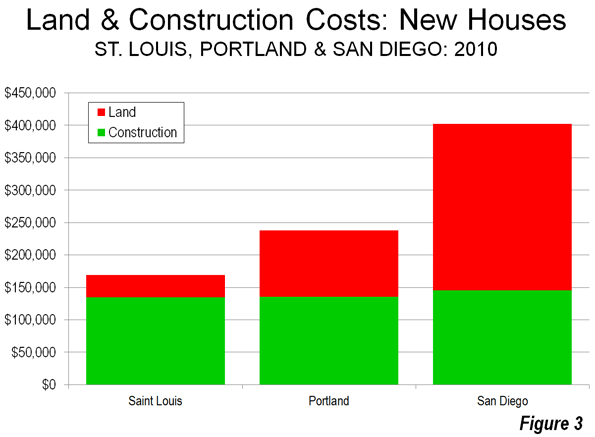 By comparison the Median Multiple was 4.2 in Portland (60 percent more expensive ), 4.5 in Seattle (75 percent more), 6.1 in San Diego (135 percent more) and 6.9 in San Jose (175 percent more. While other metropolitan areas were reeling from house price increases that still have not returned to normal, St. Louis (and other metropolitan areas, like Dallas-Fort Worth, Houston and Indianapolis) have continued to experience affordable and far more steady house prices (Figure 1). 29 percent less than in New York. 31 percent less than in San Jose. 23 percent less than in San Diego. 19 percent less than in Seattle. 12 percent less than in Portland. Things Could Get Better for St. Louis: Moreover, the gap could become larger, especially as governments in California try to outlaw new detached housing, under Senate Bill 375. None of this is good for young households or less affluent households who will have to leave to find housing that meets their desires. Many will need to leave to fulfill their dreams. While there is little agreement on the magnitude of the effect of growth controls on home prices, an increase is always the result. The Secret: Just what did the St. Louis leadership do to improve its competitiveness so much? Nothing. They just stayed out of the way. Unlike their counterparts where house prices exploded, St. Louis officials did not prohibit people from living where they wanted on the urban fringe and they did not force new houses to be built on postage stamp lots. Nor did they adopt land use regulations that drive up the price of land (Figure 3) and, in consequence housing), just as an OPEC embargo would raise the price of gasoline. When the easy money came and lenders were begging households with insufficient resources to take mortgages, the planning embargoes drove up house prices and invited undue participation by speculators who know the difference between a competitive and a rigged market. There are positive signs as a result of this affordability advantage. St. Louis has been attracting more young residents. Recent data indicates that St. Louis ranked 15th in high tech job growth out of the 51 metropolitan areas with more than 1,000,000 over the past decade. It would be expected that St. Louis would trail fast growing Seattle, Raleigh and Charlotte and perennial tax consumer Washington. However, St. Louis can be placed better than perennial leaders San Jose, Boston, Portland, Austin and New York. Budding local efforts are aimed at encouraging entrepreneurship, even as California and New York search for new ways to say "no." Succeeding by Being St. Louis: The improving prospects of St. Louis are not the result of a taxpayer financed marketing campaign or a payoff from the usual "let's copy Portland" strategies (or even Cleveland, as one analyst put it a couple of decades ago). St. Louis cannot compete with the weather in the Bay Area, does not have San Diego's beaches, the mountains near Denver nor the natural beauty surrounding Seattle. But it does have an affordable life style. St. Louis can succeed only by being St. Louis. It is a metropolitan area with a great past, and many fine civic institutions, including great parks, sports teams and a world class orchestra. This long laggard Midwestern metropolitan area may face its best competitive prospects since Chicago passed it in population in 1870. Local and state leaders need to stay away from the policies that would dilute St. Louis' principal competitive advantage, a low cost of living, due to a housing market left to operate without destructive distortion. Submitted by Huynhkimnga on Wed, 08/14/2013 - 02:17. Submitted by huskar4393 on Mon, 05/27/2013 - 21:56. Submitted by haonhientran on Fri, 03/29/2013 - 20:57. Submitted by haonhientran on Tue, 03/26/2013 - 04:01. Submitted by nhannam on Thu, 11/29/2012 - 23:42.